Flame arresters approved as in-line detonation flame arresters prevent light-back at the deflagration and stable detonation of potentially explosive vapor-air and/or gas-air mixtures. 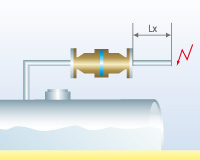 If a flame front propagates through a pipe, its speed will increase proportionally to the length of the pipe. If a pipe is shorter than 50 times (respectively 30 times for explosion group IIB and IIC) its internal pipe diameter, the flame will propagate at subsonic speed. In this case, securing the protected side by a deflagration flame arrester will be sufficient. If the pipe is longer than 50 times its internal diameter (valid for explosions group IIA, IIB1, IIB2, IIB3 respective 30 times for explosions group IIB and IIC) flame will propagate at supersonic speed that means in a detonation. Inline detonation flame arresters are automatically approved as inline deflagration flame arrester. Flame arrester are approved to EN ISO 16852 (formerly EN 12874) and are issued with an ATEX certificate for stable detonation. Our in-line detonation flame arresters are especially designed to keep pressure drop low and they are small in size.